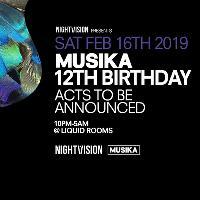 We are holding a huge event in THE LIQUID ROOMS (Official) AND WAREHOUSE complex early next year to mark 12 years of Musika, one of the 2 Nightvision founding brands. We have put together a jam-packed line-up full of world-leading artists, some who have played Musika over the years, some who have not. Stand by for our 1st artist announcement coming next week. In the mean time, grab a bargain £15 pre-sale ticket NOW.